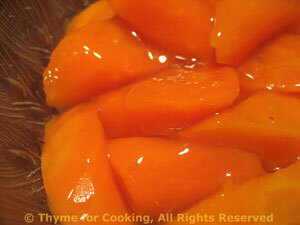 Carrots, Sweet and Pungent, Thyme for Cooking easy Chinese side dish. In a typical 'Chinese Dinner' these would be served as an accent dish. For our Western dinner, we added more carrots and made it our vegetable side dish. Put carrots in a small saucepan, add stock and cook, covered, 15 - 20 minutes or until are done. Remove carrots, discarding stock. Keep carrots warm. Add all ingredients for sauce to pan. Heat, stirring constantly until thick and clear. Pour over carrots and serve.